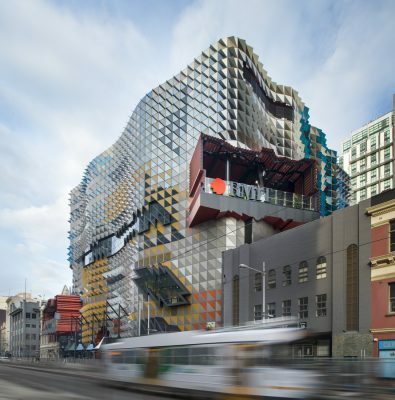 RMIT University in Melbourne, Australia, is a unique city campus, embedded deeply into the downtown grid of a major city of 5 million people. 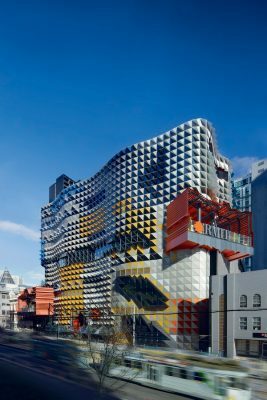 This new building, called the Swanston Academic Building, is an idea about building a vertical campus and drawing the diversity of the city deeply in to the design conception. As student space is not available like a green campus, the project proposes a vertical ‘stack’ of informal ‘open’ student spaces, each connected to a central circulation system of escalators and stairs. 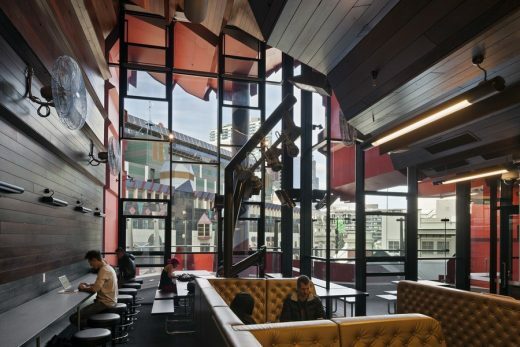 This creates a three-dimensional armature of student infrastructure within the building, and is also used as a means of providing a sustainable natural ventilation system within this network of spaces. These student spaces are named ‘portals’ as a hybrid of the physical gateway, and the virtual access to knowledge and information. Each is a double height space, and externally they appear as large ‘holes’ in the facade, each with a distinctive profile based on editing the surrounding cityscape. The building is designed to meet the long-term needs of the University for teaching and learning spaces, with over 80 spaces including large lecture theatres, which are stacked vertically within a long span structure. All of the learning spaces, which vary in capacity from 30 to 360 students, are designed around new models of learning pedagogies, particularly collaborative and project based learning. 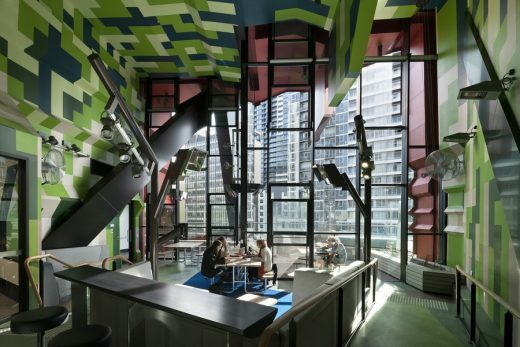 Through this approach, a gradient of different learning spaces are provided within each level of the building, reflecting the diversity model that is typical within the city condition. 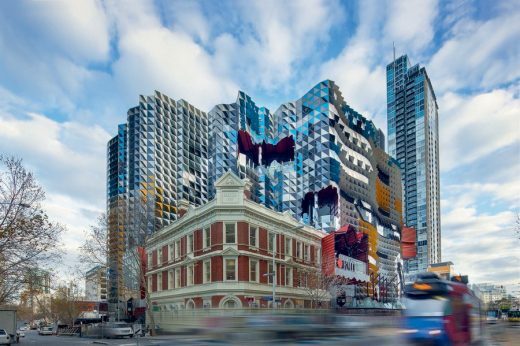 Externally the building form, with its geometry of compression and expansion, was created out of a series of design operations which modeled the ‘force’ of the surrounding city on to the building itself – like a gravitational force, or crumpling an aluminium can. 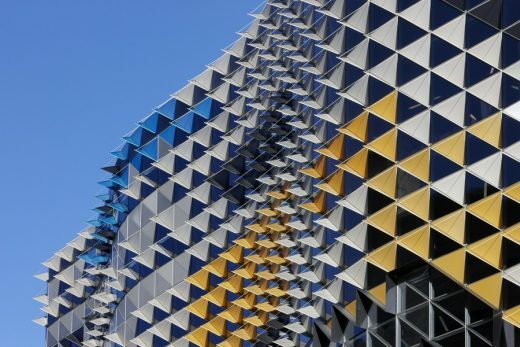 The colours of the facade are also derived from a mapping of the surrounding cityscape, via the operation of a virtual diorama. In doing so the colouration can be perceived as part camouflage. The distinctive triangular window format (three windows per level) provides for particular views from the interior – up, down and straight out – and also optimizes the environmental performance of the façade system. Lightweight sunshades, varied in dimension to suit the orientation of the building, further extend the super-performative quality of the buildings envelope. 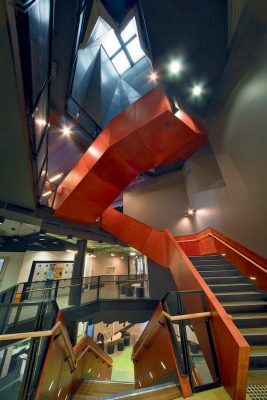 The intended result from these design strategies, is to create a building as a city campus, one which is quite literally the campus as a city in microcosm – an intense vertical diversity for the students who use it – and deeply and specifically connected with the local city the building inhabits.